Chartwells has taken heat from students regarding its high prices and quality of food. This summer, Chartwells increased its prices four percent, according to Associate Director of Dining Services Leean Spalding. The increase was based on the Consumer Price Index and was approved by the university. “The increase covers inflation on the price we pay for food, non-food purchases as well as other high cost items such as labor cost increases and health care costs,” Spalding said. Sophomore health science major Allison Brodmerkel voiced her complaints in the Quinnipiac Class of 2016 Facebook group. Brodmerkel’s post requesting a petition to lower prices gained over 50 “likes” and caught the attention of Student Government Association representative Theo Siggelakis who said SGA will analyze the increased cost of food and how that correlates to the percent increase in meal plan. Last year, Brodmerkel ran out of meal plan two months before the end of school and had to add an extra $200 to her plan. She credits running out of money to eating healthy. “I felt like I was forced to start eating unhealthy which was really unfair,” she said. In addition to an increase in food prices, Chartwells increased the meal plan from $1150 to $1200. 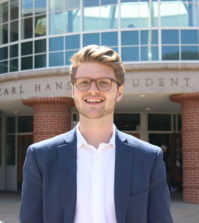 SGA is reaching out to the administration to receive the price of food items at the Mount Carmel Dining Hall so that it can assess the increase, according to Vice President for Student Concerns Evan Milas. Once the analysis is complete, members of SGA will discuss whether the increases are deemed fair. Milas noted that it would take time for the issue to mature into a proposal if warranted. 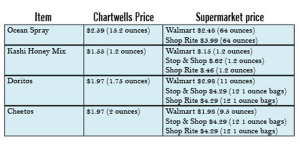 While Chartwells prices are considerably higher than that of area supermarkets, Spalding attributes the prices to the entire process of purchasing, preparing, and serving the food. For example, Chartwells sells 32-ounce Gatorade for $4.42. The same item at Walmart in Hamden Plaza is sold for just $1, a 342 percent difference. 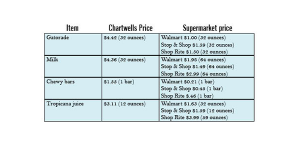 Similarly, a quart of milk costs $4.36 from Chartwells, but only $1.49 at Stop & Shop. Shop Rite sells half-gallons of milk for $2.99. The cost of food, labor to prepare and serve it, paper supplies, cleaning supplies and products, utilities, medical and dental benefits for employees, state and federal taxes, maintenance of the facility and equipment, kitchenware, uniforms and safety shoes all add to the price students pay. Spalding also specified a high rate of theft and the fact that Chartwells operates at a loss for 18 weeks a year due to the university being closed. “We do witness our guests consuming their food before they get to the register. Also we frequently find plates of food left in the servery when the student has decided to eat something else. Empty plates, cups and bowls are found in servery every day,” Spalding said. “If we compare what it is produced versus what is rung up at the register they are never the same. 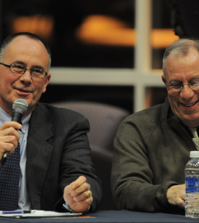 The amount rung at the register is always less,” Spalding said. Brodmerkel thinks that a change in the meal plan system could not only benefit students, but also decrease stealing. Brodmerkel’s dissatisfaction boiled over when she purchased three bags of chips for a study group. The final amount was around $10, she said. “I can go out to Costco and buy myself a value bag for [much less],” she said. Though other stores offer the same foods and drinks as Chartwells for cheaper prices, the process of bringing the food to Quinnipiac, preparing it, and serving it sets Chartwells apart. Tropicana juice (Cranberry, Grape, Orange) sells for $3.11 from Chartwells while it costs just $1.59 at Stop&Shop, a 95.59 percent difference. Chewy chocolate chip bars sell for $1.55 each, but can be found for as low as $0.22 each at Walmart. Even the most expensive option, $0.46 at Shop Rite, is considerably less than the on-campus option. Ocean Spray Juices sell for $2.59 for 15.2 ounces at the Café and Bobcat Den. Walmart sells similar juices for $2.48 for 64 ounces, an 11-cent difference for more than four times the amount. 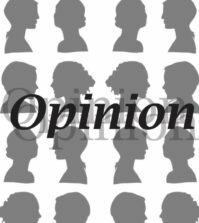 “Quinnipiac should look into what other colleges are doing. There’s always a better way to do things,” said Brodmerkel, who suggested that a swipes-per-day system might be more efficient because students can get as much food as they want which would also decrease stealing.